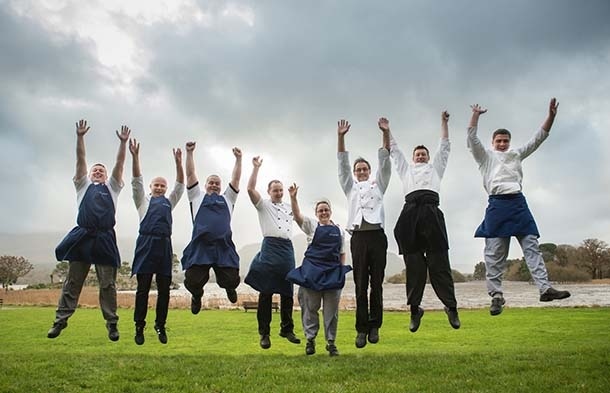 If you would like to be part of an award-winning team, are enthusiastic, energetic and driven to exceed guests’ expectations, then The Lake Hotel is the place for you! Awarded the prestigious 2 AA Rosettes for the past two consecutive years. One of the 9 Kerry Hotels listed in the Trip Advisor Traveller's Chioce Top 25 Hotels in Ireland. Gold Award with the IASA for our Accommodation Team. “We Put Our People First"
Sarah Mannix (HR Manager), The Lake Hotel, Lake Shore, Muckross Road, Killarney, County Kerry, Ireland. The mission of the Human Resources Department of The Lake Hotel together with our Head of Departments is to recruit, develop and retain an excellent workforce that exceeds guest’s expectations. Enjoy our beautiful views and wildlife, we are located beside the 25,000 acres Killarney National Park. Why spend your day commuting in city traffic when you can have the beautiful surrounds of Killarney with all it has to offer on your doorstep? The cost of living in Kerry is less than 50% compared to Dublin and 25% less than Cork or Limerick. Our people are our number one focus here as we have learned that a happy team equals happy guests, we encourage and support a strong sense of teamwork throughout the organization. With team members from all around the world as well as guests who visit from every corner of the globe be part of our diverse and exciting workplace. There is never a dull moment at The Lake! We invest in high-quality training that will make you great at your job. Many of the skills you learn here are transferable so you can take them with you and use them to travel the world! The experience that you will gain here will be recognized around the world, opening doors for you to future employment in multiple industries. At The Lake Hotel one of our core values is moral and banter which makes The Lake a fun place to work. As a family run hotel, our team is treated as extended family members. In our recent employee survey, overall job satisfaction was rated as 85%. 2018 Tripadvisors’ Travellers Choice Awards, Top 25 Hotels in Ireland.